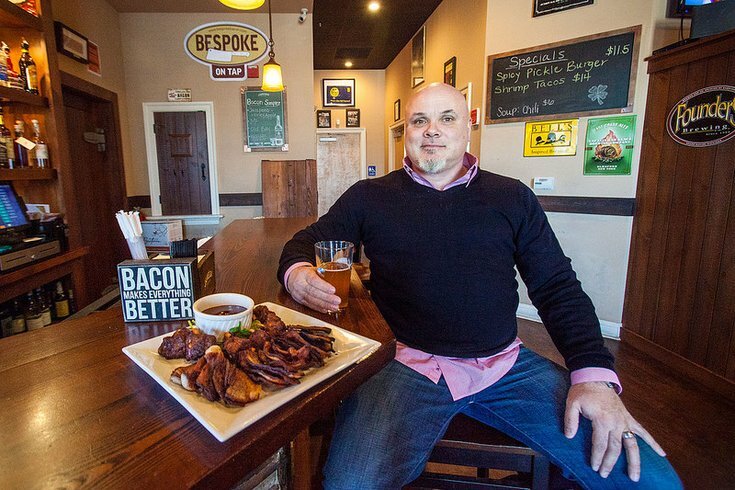 Bespoke Bacon founder and former Philadelphia police detective Brian Wolfinger lounges at Harry's Blue Bell Taproom, which serves his gourmet bacon. Once upon a time, men and women across the country found themselves sweating bullets in the presence of "The Man" -- the power figure who, muttering through a lips-gripped cigarette and pointing a finger with gusto, could usher in a lifetime of work with two simple words: "You're hired." That's the myth of what's sometimes referred to as the "gold-watch job," best explained as those comforting last-you-a-lifetime jobs that send off employees with a gold watch upon retirement. The very idea evokes nostalgia for a work culture thought to be extinct in the post-industrial new economy, compounded by changing work preferences of youngsters who could have as many as 20 different jobs in their lifetime. But here's the thing: People changing jobs is nothing new. In fact, they've always been changing jobs -- or at least for as long as the Bureau of Labor Statistics has been taking measure. Research has yet to be conducted regarding the number of times American adults embark on entirely new careers, but 2014 data from the BLS does demonstrate that average job tenure is about the same today as it was three decades ago. In 1983, average job tenure was 5.1 years; in 2014, it was 4.6 years. Even Baby Boomers managed to change jobs an average of 11 times (so far) in their lifetime. The truth is that today's actively working generations hold hands together as job-switchers -- the urge for the switch-up being a mere symptom of humanity. That said, it's particularly true of mid-lifers: Data suggest significant job-switching is best represented by those between the ages of 25 to 34, and 35 to 44, groups that -- setting aside the unpredictable 16-plus crowd -- boast the lowest dips in job tenure, before leveling into averages of 10-year job tenure in older age groups. It falls snugly in line with the narrative that there have been, and always will be, those who wake up at 40 (or earlier) and mull a thought that's as magnificent as it is scary: What happens if I start over? Here, the stories of three Philly professionals who not only entertained that thought, but mustered the courage to, for better or worse, make a proverbial U-turn -- or steer in a new direction altogether. Police Detective Turned Techie Turned ... 'The Bacon Guy'? "I always say, 'I still don't know what I want to be when I grow up,'" laughs Brian Wolfinger (pictured above). Wolfinger, 43, came from modest means in Bridesburg, Pa. Book smart, he stumbled out of high school with a full-ride academic scholarship to Temple University that, he says, he "pissed away by drinking." He left Temple after a semester to dabble in a slew of occupations: a landscaper, a Sears technician, an auto-mechanic, a waiter at Italian Bistro -- "just about everything but working in a funeral home." At 24, he took an aptitude test for the Police Academy on a wing and a prayer. He scored well, took an interest in the work, and spent two years as a footbeat policeman in the Center City District and patrolman in the 17th District before being promoted to detective in 1999. As detective, he jokes that colleagues in the department -- an institution he characterizes as "200 years of tradition unimpeded by progress" -- would tease him about carrying his laptop in his patrol car, as they all shuffled papers and fumbled with floppy disks. When the district attorney decided to refocus how it prosecuted cyber crimes, a supervisor sent Wolfinger to a computer training conference, where he realized his real ambition was to be a "geek cop." "At some point, I realized my future didn’t lie with the department," he says. "I’m not a really patient guy, and I knew that I was going to be banging my head against the walls – I’d be doing that now. I’d be farther up in the hierarchy, but I knew I wasn’t going to get where I wanted to be in my lifetime." So, he resigned as detective in 2003 to pursue digital forensics in the private sector; today, he owns his own e-discovery business, LDiscovery, which made the Inc. 5000 two years in a row and made Deloitte's Fast 500 last year. He also serves as an expert witness. But, long regretting that he didn't get involved with the food industry, he found that his search for fulfillment -- and more money, of course -- wasn't quite done. "Bacon will change your life," he says, biting into -- what else? -- a strip of bacon. He recalls being drunk at his neighbor's son's birthday party in April 2012 with his caul-de-sac confidantes, two of whom (now his business partners) confided that his bacon was something otherworldly -- a meaty delight that begged to be shared. So, with a shrug and a "Why not?" he built a business out of it, selling pork from farms across Pennsylvania that he custom-makes into flavored bacon. 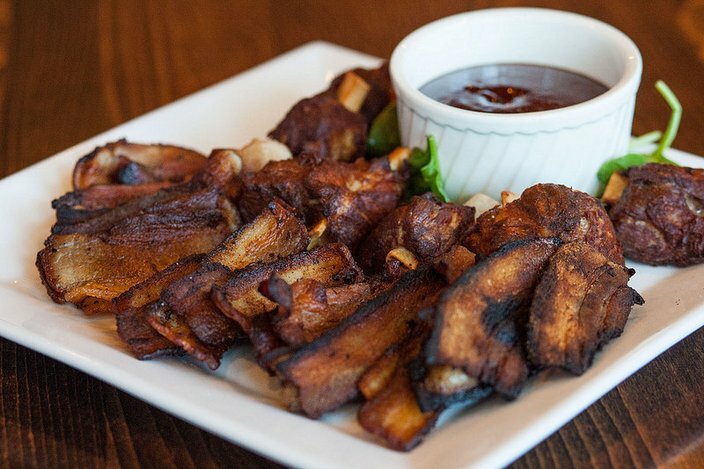 He distributes the meat directly to consumers, as well as to local restaurants like Harry's Blue Bell Taproom, City Tap House in University City and Cantina Feliz in Fort Washington, Bucks County. In truth, he's still not sure whether Bespoke Bacon is the last great idea and career move he'll make ("I'll be 'the bacon guy' for the rest of my life, though," he jabs); he admits he may yet decide to start over -- again. But, he says, the risk-taking's always worth it. He compares career-switching to playing the lottery. "Sometimes," he says, gesturing as if about to explain the meaning of life, "you have to buy a ticket." Former police department colleagues, he says, have emailed him in the past commending him for his "ballsy" career-switch -- but, to him, he doesn't feel his move has to be perceived as an exception, rather than the rule. "If you’re frustrated with your station in life, you’ve gotta be in it to win it -- you’ve gotta buy the ticket, step up, and say, ‘I’m gonna change this.’ If you wait for someone to airdrop help to you, nothing’s ever going to happen, and you’re going to be bitter, looking around at what all your friends accomplished. And you know why? Because your friends all went to the store and bought the ticket, and you didn't." For Wolfinger, it's a life of "no regrets." “I never regret leaving the force, but I do wonder what my life would be like had I not – I might not have a bacon company now, for sure," he says. Then he emits a laugh straight from the gut. Lori Ramsay Long is like any other mother: For years, she pushed to ensure her daughter Kylie, 15, would have the extracurriculars and sterling grades she needed to excel in college. Problem was, that's not what her daughter had in mind. An aspiring dancer who's already traveled to L.A. and Manhattan for performances, she's shaping a career path on her own terms. "We all just want our children to be happier than we were, to hopefully not have to struggle like we did or make the mistakes we did," Long says. "And I knew, when I looked at my daughter, that she was going to take that leap of faith with dance, whether I was with her or not. So, I decided that I would do it with her." Long's career switch was an act of love. In May of last year, at age 47, she opened a Philadelphia branch (on South Street) of Millennium Dance Complex, which offers affordable programming for aspiring dancers as well as rehearsal space for traveling professionals (like Britney Spears and Justin Timberlake, in other locations). Her concern was that, because Philadelphia doesn't have the same level of resources New York and L.A. have for young, up-and-coming dancers, her daughter could fall behind because of sheer proximity. Shouldering that responsibility, Long's solution was to create a space for her daughter that could be all-her-own. "At a certain point, you think about the legacy you’ll leave behind for your children and what that means, and I knew I wanted her to have a place that would be part of who she is -- her passion," Long says. "I don't know that I could have taken the leap of faith without her, and knowing this didn’t exist in the community and that, if it didn’t exist for her, it didn’t exist for anyone else as well. It gave me this fuel to take the leap. Because it was a difficult one, and it came with big lifestyle changes." Since 1996, Long, of Camden County, has been working a steady job in emergency rooms in Texas, Florida and Pennsylvania -- first as a nurse, later as a forensic nurse after getting her degree from Drexel University's College of Medicine. The job, which involves taking care of victims of violence in a timely fashion as well as collecting evidence for death investigations, was a grueling schedule for her -- especially in recent years. The switch has given her more peace, she says, but it also comes with its own host of stressors. “It’s certainly been difficult for my family, and they continue to be concerned that I made this leap of faith, and what does that mean, and will I be able to provide for my daughter the way I had been," Long says. "But while I might miss having more financial security, just being able to be with my daughter, knowing that I’m not going to live forever, I find much more comfort in knowing that I have those moments with her. To me, that matters so much more." When Adam Browne was a teenager working his way through college on Long Island, he worked his fingers to the bone as a deli employee. He did all of the grunt work: stocked shelves, mopped, manned the grill -- all the usual suspects. It was labor-intensive work, but he loved it and, despite the equally intensive endeavor for his college degree, saw a future for himself in food. After staving it off at age 21, Browne -- a Long Island native -- says he felt newly compelled to leave the nest. So, he turned down a partnership offer with the deli and instead left for Los Angeles, where he worked in hospitality before phasing into corporate sales work to support his wife and kids, the thought being that he'd settle into one of those gold-watch jobs. The search for a sales job brought him to Philadelphia. "I was in sales at a couple companies, and I hated it – I hated the deadlines looming over me, I hated the climate within the company of other sales reps and the slimy cutthroatedness. It just wasn’t my deal at all," Browne says. "And I’d always, in my head, gone back to that partnership at the deli, working for myself, earning a good living, an established business, and I always kicked myself – it was this huge regret." At the doorstep of 40, red flags were further raised when his financial planner informed him his long-thought-lucrative and dependable job was also not financially going to be able to support his family ("We were living paycheck to paycheck," he says). Soon after, he began brainstorming ideas during light days at work. 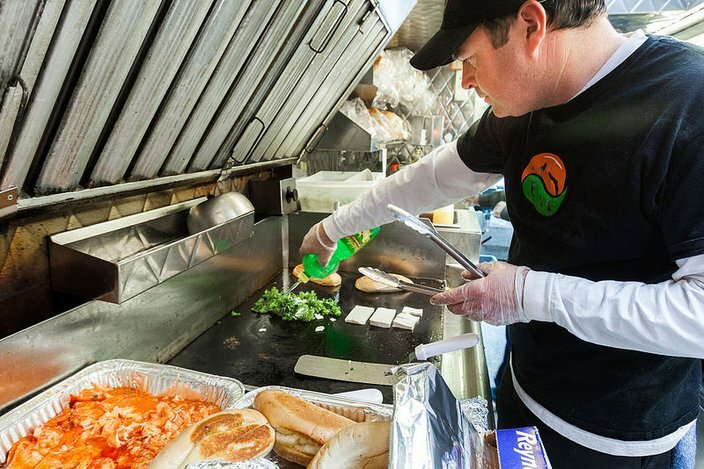 Thinking back to his sandwich-shop dreams, he mentioned the idea of opening a food truck to his wife, and the two agreed the timing was right for both of them to quit their jobs and give it a shot. But on his way to food-truck shop, he panicked. He was, quite literally, faced with the option of moving forward or turning back. "Driving down Route 206 in Jersey to see our truck, I literally had to physically fight within myself the urge to turn around," he says. "I pulled over three times on the way down. I stopped the car, and thought, What the hell am I doing? What am I getting into?" Then his boss called -- a reminder of what he didn't want to do. He kicked the gear into Drive and drove off to meet his new food truck, now branded as the Surf and Turf Truck (which can usually be found at Love Park and office parks in Montgomery and Chester counties). "It was the scariest thing I’ve ever done," Browne says. "Quite literally, it felt like I was jumping off a cliff – the sensation was fly-or-crash." The trade-off for the switch, he candidly says, is that he often finds himself working stressful 17-hour days during the summer season. But the satisfaction of owning his own business (and having Mondays off, he says) makes up for it. “For me, doing this cleared up the regrets of not jumping at that deli opportunity 20 years ago," he says. "Have we made mistakes? Yeah. But you move on. You learn from them, and always look forward – that’s the only way to go about it." Because, he says, "People who do great things jump."